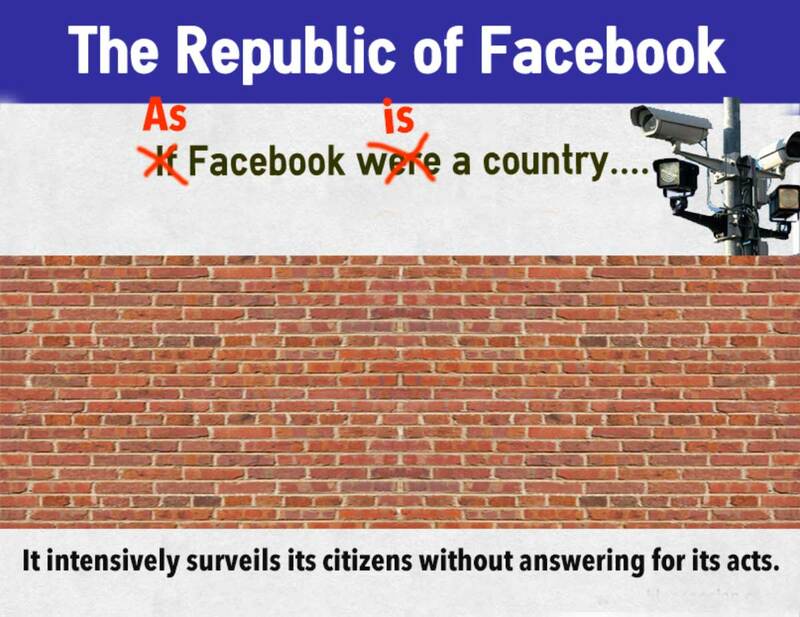 What do you mean “If” Facebook were a country? Is a country merely constituted by a census of number of supposed inhabitants? It memes so. In this country, there are people who delete their content, but on request for their data, discover that Facebook has not deleted it. Other citizens describe when their content is removed by Facebook. All against a background of promotional cheery videos telling us how open Facebook is, how it is some kind of wonderful ecosystem of sharing our lives. Yet people of this nation are geolocated based on not only their media, but people they associate with. Most interesting were the insights into the Facebook Content Moderators, working in countries where paying them $1 an hour is not a big issue. Their decisions on approving content is based upon 0.9 seconds examining a photo, and a whopping 20 seconds assessing the content of uploaded video. There was quite a bit of uproar last night (rightfully so) when the awful video of the Falcon Heights shooting disappeared from Facebook. We are told now “it was just a glitch”. One can wonder, but notice how a person is never identified beyond “a spokesman”. This has mirrored all my failed attempts to get answers about my catfished experiences — talk about a rigged system, Donny– the complete walling of Facebook from direct interaction, any assumption of responsibility to any of its citizens, is a facade. A chimera. Smoke. It is done in a stone wall manner that makes an Orwellian 1984 look like a Barney video. Facebookistan is unassailable. No one sees behind the wall. There is a name for that kind of country. Also quite telling were the documentarians attempts to visit Facebook headquarters in California and India, and a rebuffed by security guards. The one on California laughed off the request to speak to a PR department, instead offering them candy. In India they were told they needed to make an interview, but there is no way to contact the person to request an interview. There’s no secret around here of my Facebook disdain; I have quit before, returned because of the needs of a project with some kind of rationale of minimum preserve, tried in vain to work from the inside against the rampant catfishing scams using my photos. I’ve tried to rationalize by having an account that does very little (I log in for maybe 30 minutes per week, look around, leave), never “liking” or “reacting” or whatever jujubee icons people click these days. Yet I cannot help but feeling complicit into their dirty empire. The most common response from people I see being surprisingly active in Facebook is the “everyone is there” and the “relatives and friends they would never hear from”. Sure. The only possible way at all to stay in touch with your friends and relatives is to freely sell your information that is cultivated in masses, refactored, and sold. Your data, your personal data, is sold. Well frankly, if the people I care about cannot find any other way to stay in touch with me, I just may have to wave goodbye as my ship leaves the country. I am ready soon to revoke my citizenship in Facebookistan. I criticize not in the least the people who rationalize their citizenship, but my conscious is bothering me. I have a few client web sites using Facebook Pages that I have autopost through my authentication (believe me it was easier to do this way than having them figure out the authentication). Top / Featured Image: Remix of a bunch of stuff just lifted off the Google. Not at all cleanly openly licensed, but I’ll pitch it as a parody of a widely repeated assertion. I left without ever arriving. That is, I had an account in which I did nothing, not even a bio. After some fuss I persuaded it to go away. I live well without it. I miss conversations with people in my network, and nothing bad happens. I really welcome the opportunity to explain this as refusal. Recently I was in an initiative that was important to me and Facebook was the default community forming platform. I explained to the organisers that I don’t and whoa, it was just like being a vegan. People adjusted, nothing bad happened. I think conscientious refusal and the consequences that go with it may become more important to digital citizenship. I stand with you on being a refuser. I also refuse LinkedIn, Academia.edu. I don’t however want be one of those vegans who are always sending their meat eating friends messages of derision or guilt. Yet I am a bit surprised by some open advocate colleagues who seem to be active there. What bothers me are the rationale some make of the inevitability of Facebook. It’s not the only way to communicate. Alan, there’s another creep is using your photos in his profile. I can only presume he’s trying to scam naive folks. As always, he’s a widower with a child living in the United States but a native of a European country. I did report his profile as fake (for what it’s worth). I’ve taken screen shots if you want to see them.